The past week was spent traversing the immense agricultural plateau of the Meseta and Tierra de Campos. Few trees, big sky, only occasional villages, and long stretches where the only human presence was the long procession of pilgrims migrating westward. The lack of distractions and variations tends to make the very act of walking to be the mind’s principal occupation. As Robert MacFarlane puts it in The Old Ways: A Journey on Foot, walking becomes “sensational” – it isn’t just conducive to thought, it becomes the form thought takes. I walk, therefore I am. Perhaps it is similar to the way that cinema thinks through the movement of the camera. It isn’t forming propositional thought, but is simply absorbing through its attentive motion the shape of the world, the textures of existence. Tonight at dinner a young man from Munich, Daniel, told me he sometimes listens to classical piano as he walks. That music is his passion, and playing piano is his daily practice at home. And he knows the repertoire well. 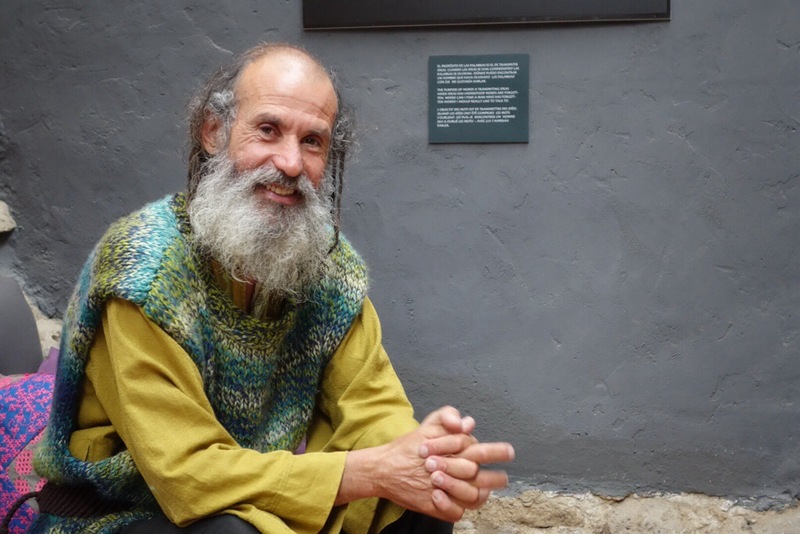 But Daniel said that is as if out here he is hearing the music more clearly, more completely than ever before, because his mind has become more acutely attentive and centered in the act of walking the Camino. It is as if the music he listens to has slowed down in order to reveal its structure to him. But I found myself relieved today to return to the flowered landscapes and peaceful villages, and to resume the undistracted act of walking that is the Camino’s most eloquent and heartfelt prayer. A few miles before reaching tonight’s hostel in the village of Terrafillos de Templarios, I passed the halfway point to Santiago de Compostela: 245 miles. This was my 17th day of walking, with 16 to go before – God willing – I reach Santiago. 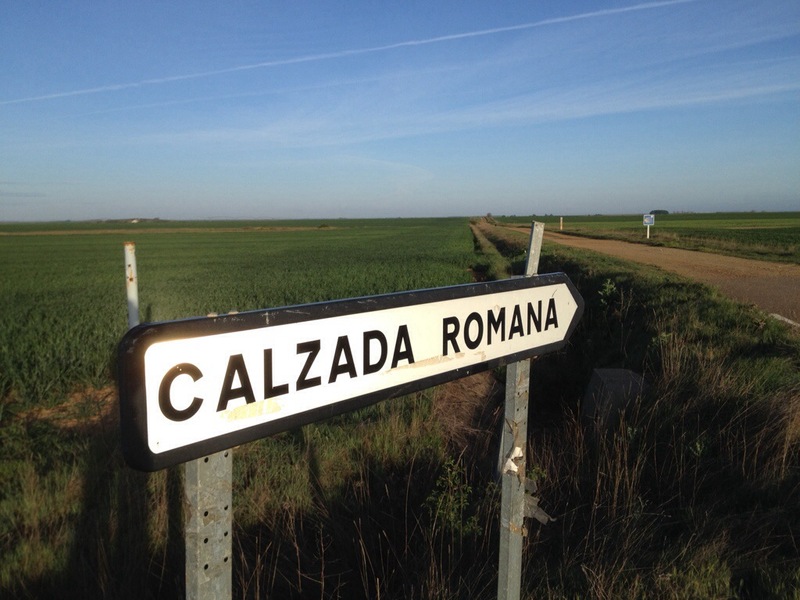 The first 10 miles today were on a straight dirt road between green wheat fields under the big Castillian sky. There was a sense of endlessness to the walk that some found tedious or wearying, but I felt to be exhilarating, like striding into infinity. Every so often a row of trees provided shade from the glaring sun, as in this 30 second video. If you want to experience the length of my walk in real time, replay it 27,000 times. 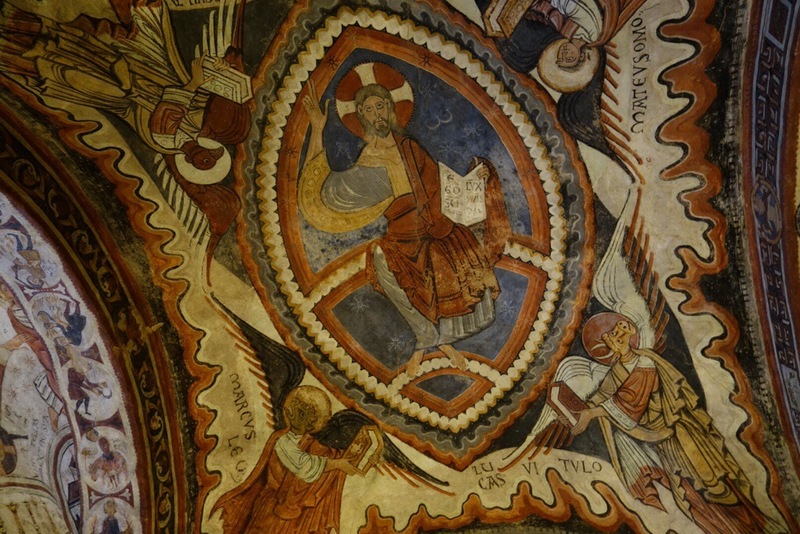 Holy Saturday began, like the previous two days of the Triduum, starting in the dark to walk by the light of Paschal moon and breaking dawn. Those early hours, the matins and lauds of newborn day, will surely remain among the sweetest of the Camino. 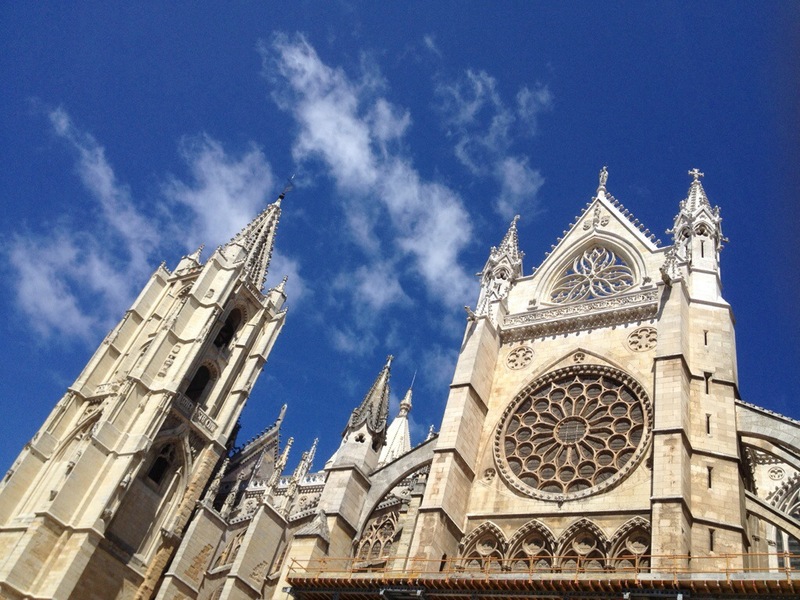 After woods of oak and pine, sleeping villages in peaceful valleys, and the World Heritage site of the oldest discovered human remains (900,000 years ago), I pressed on into the urban sprawl of Burgos, determined to make the Easter Vigil at the great cathedral. I returned despondent to my tiny, cold, windowless hotel room after midnight. In the first hour of Easter morning, it felt like returning to the tomb. I didn’t go out again until noon. It was raining. The streets of the old city seemed dead. I sang “Welcome, Happy Morning” under my breath, more out of habit than conviction. I happened to pass by the church of San Nicolas, whose splendid stone retablo was on my must-see list. So I ducked in out of the rain. 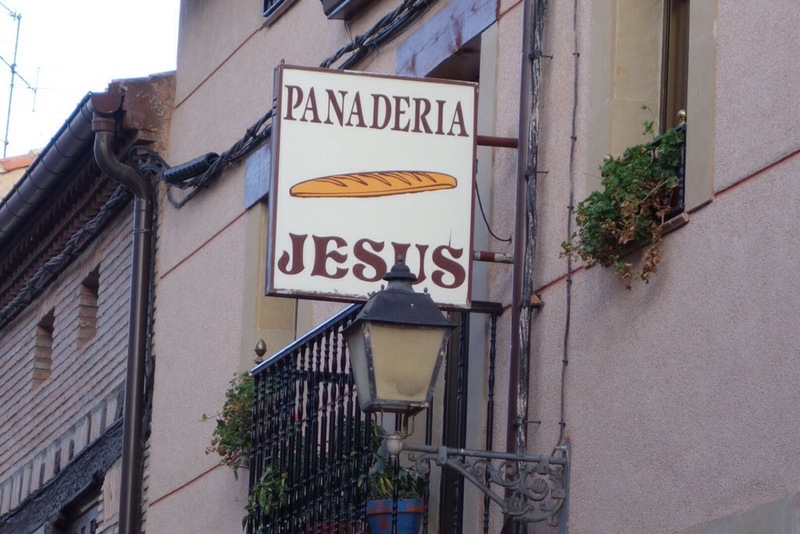 And there, to my utter surprise, was the risen Christ, returning to the doubting and the sad just as he promised. “I am the dance and I still go on!” All the rest of us joined in hearty singing of the hymns and Alleluias, punctuated by loud shouts of “Viva!” Tears streamed down my face. O beauty so ancient and so new! Yesterday I was in Santa Domingo de la Calzada, whose cathedral keeps a couple of live roosters in the south transept in tribute to a local miracle involving a cooked chicken coming back to life, thus stirring the sheriff to leave his dinner in time to rescue a hanged man from death. It’s a long story. This morning I slipped out of the sleeping town before dawn, by the light of the Paschal moon. By the time I reached a large wayside cross, the dawn was blazing behind me. 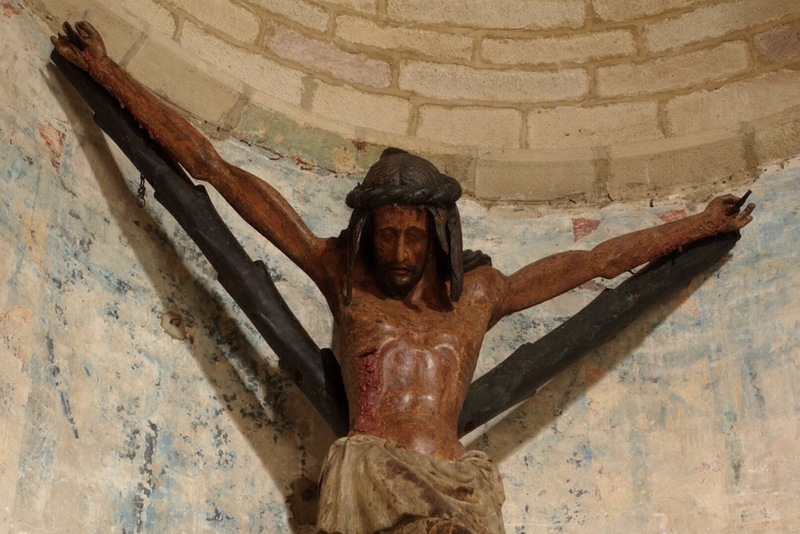 It was a dramatic beginning for the great three days of the Paschal Triduum, the ritual mimesis of Christ’s passage through death into resurrection. 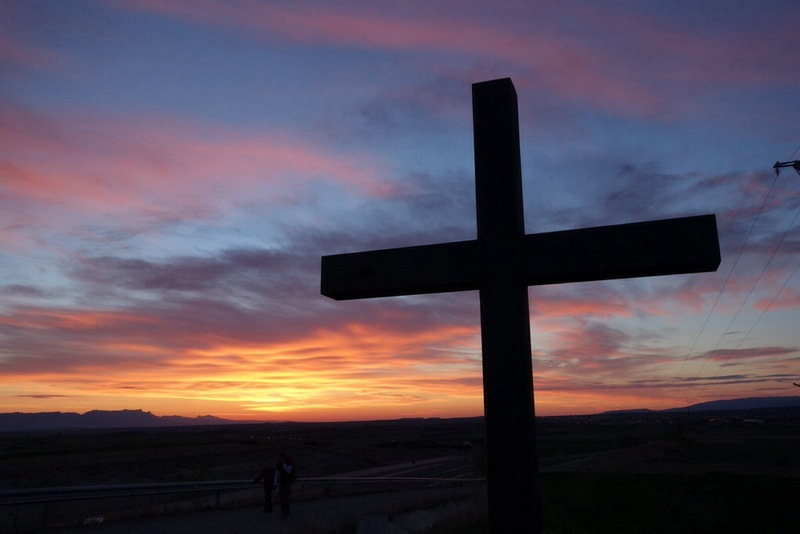 I have been wondering what Holy Week, and especially the Triduum, would feel like on the Camino, so far from my accustomed ways of keeping these days. Each day I walk to a new place , hoping there will be some kind of liturgy there, and that despite the language and cultural differences I can still be deeply engaged in the texts, prayers and singing. And there have been some memorable moments so far, especially the processions. But as the week enters its climax, how much will I miss the familiar words and powerful hymns of my own tradition that have always, for me, been essential to the experience? Will my ritual dislocation have its own unique gifts to offer? God provided for them food enough. 18.7 miles today, plus 17.8 yesterday, made the longest two-day total of my life. Today’s cooler overcast weather made the miles easier, but a slightly sore left foot and right knee, worn down by yesterday’s grind, started to slow me down with 8 or 9 miles left to go. I felt a bit discouraged. But then I met an extraordinary pair of hikers, and their company lifted my spirit. My body felt fresh again and the miles to Najera flew by. Their sudden appearance felt like such a gift. God provides. 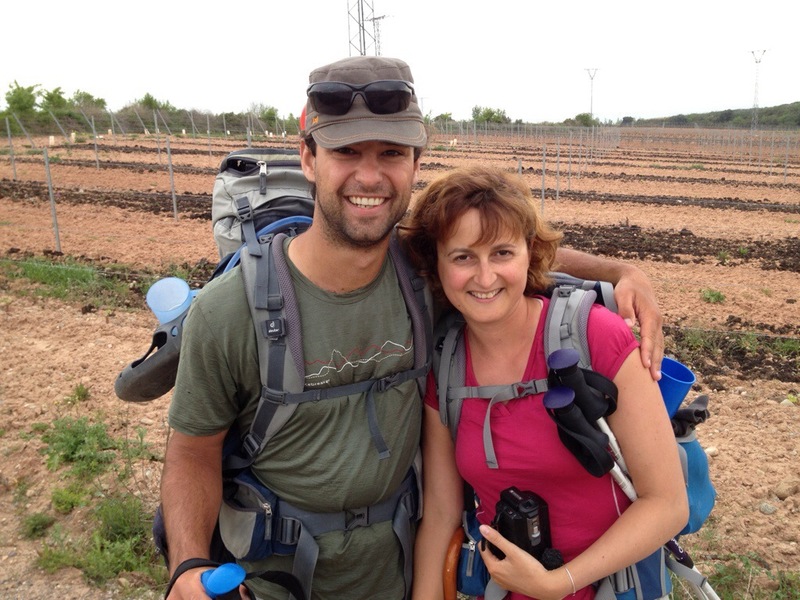 Mathieu Sabourin and Julia Gaubert are walking across Europe. This French couple began in Estonia in May, 2013, headed south for the Balkans, crossed the Alps from Italy to France in December, and in two more months will complete their journey in Portugal. Having entered professions in law and finance related to the European Union , they both felt a desire to know the people and places of that union more intimately before they went any further in their careers. So they started walking, shooting a documentary as they go (as we walked and talked, I realized that Julia was taping bits of our conversation). Their time on the Camino is unlike the rest of their journey in one respect. Elsewhere, two people walking with packs has elicited a great curiosity, often resulting in rich conversations and offers of hospitality. On the Camino, however, pilgrims are such a common sight that we are barely noticed, except for the occasional wish of “Buen Camino!” Another difference is Mathieu and Julia’s more leisurely pace. They have already taken two layover days this week, while the rest of us have slogged on without a break. But see how far they have come! There may be a lesson here.